local tribes to their cause. But here also, the feelings of guilt and shame over the duplicitous role Lawrence felt he had been playing came to a head. So he embarked on a journey that would take him north through dangerous country into Syria. “I felt that one more sight of Syria would put straight the strategic ideas given me by the Crusaders and the first Arab conquest, and adjust them to the two new factors — the railways, and Murray in Sinai. Events of 5 June 1917 as recounted by T. E. Lawrence in Seven Pillars of Wisdom (1926). Accompanied by just two men, he rode north from Nebk. Arriving at an encampment of tents near Ageila, a troop of men emerged. “… through the afternoon we received fusillades of honour, deputations, and gifts of ostrich eggs, or Damascus dainties, or camels, or scraggy horses, while the air was loud about us with the cries of Auda’s volunteers demanding service, immediate service, against the Turks. “Affairs looked well, and we set three men to make coffee for the visitors, who came in to Nasir one by one or group by group, swearing allegiance to Feisal and to the Arab Movement”. Events of 2 June 1917 as recounted by T. E. Lawrence in Seven Pillars of Wisdom (1926). “Howeitat hospitality was unlimited,” wrote Lawrence of their stay at Isawiya. “We feasted on the first day once, on the second twice, on the third twice”. Nesib and Zeki were ceremonially led on horseback to the tent of their host for the meal. Moving north to Abu Tarfeiyat, the feasting continued. Soon, Howeitat hospitality was taking its toll. decent proportion of the hungering Ageyl. Events of 27-31 May 1917 as recounted by T. E. Lawrence in Seven Pillars of Wisdom (1926). Howeitat were found to be at Isawiya, at the camp of Ali abu Fitna, chief of one of Auda’s clans. “Our march was prosperously over. We had found the Howeitat: our men were in excellent fettle: we had our gold and our explosives still intact. So we drew happily together in the morning to a solemn council on action. There was agreement that first we should present six thousand pounds to Nuri Shaalan, by whose sufferance we were in Sirhan. We wanted from him liberty to stay while enrolling and preparing our fighting men; and when we moved off we wanted him to look after their families and tents and herds. Events of 28 May 1917 as recounted by T. E. Lawrence in Seven Pillars of Wisdom (1926). Lawrence found Gasim, “nearly blinded and silly”, an hour and a half later. On the way back, they were met by Auda. That night, after five days crossing El Houl, the Arabs arrived in Wadi Sirhan. But another of their party was missing – a slave. Months later, Lawrence would learn that his dried-up body had been found, next to his camel, far out in the wilderness, having succumbed to heat and thirst. Events of 24 May 1917 as recounted by T. E. Lawrence in Seven Pillars of Wisdom (1926). With Sherif Sharraf’s eventual arrival at Abu Raga came the welcome news that there was water to be found ahead on their march at Wadi Diraa. Having met with Sharraf, Lawrence’s party started out again on 17 May, reaching Wadi Diraa two days later. Here, they rested and watered in anticipation of the next stage of their march – across El Houl, a barren plain of abominable desolation. On the evening of 19 May, they crossed the Hejaz railway, fixing charges to its rails and pulling out the telegraph wires. Ahead of them the next morning lay El Houl. “We, ourselves, felt tiny in it, and our urgent progress across its immensity was a stillness or immobility of futile effort. The only sounds were the hollow echoes, like the shutting down of pavements over vaulted places, of rotten stone slab on stone slab when they tilted under our camels’ feet; and the low but piercing rustle of the sand, as it crept slowly westward before the hot wind along the worn sandstone, under the harder overhanging caps which gave each reef its eroded, rind-like shape. Events of 20 May 1917 as recounted by T. E. Lawrence in Seven Pillars of Wisdom (1926). At Abu Raga, Lawrence’s party remained for three days while awaiting the arrival of Sherif Sharraf from the railway. Events of 15 May 1917 as recounted by T. E. Lawrence in Seven Pillars of Wisdom (1926). On 13 May, Lawrence – beset again with fever and boils – confided some of his misery to his pocket diary. The following day, rest was taken in Wadi Jazil, a gorge full of tamarisk sprouting from a deep sandy bed. Next to a pool of brackish water, camp was made. Here, at Abu Ragu, for the next few days, they awaited the arrival of Sherif Sharraf, who was away raiding the railway. Events of 14 May 1917 as recounted by T. E. Lawrence in Seven Pillars of Wisdom (1926). With Feisal’s good wishes sounding after them, Lawrence and a small band of 45 Arabs rode away from Wejh in the glare of the mid-afternoon sun. “Feisal made up a purse of twenty thousand pounds in gold — all he could afford and more than we asked for — to pay the wages of the new men we hoped to enrol, and to make such advances as should stimulate the Howeitat to swiftness. between us, against the chance of accident upon the road. Sheikh Yusuf, now back in charge of supply, gave us each a half-bag of flour … and Nasir took enough on baggage camels to distribute a further fourteen pounds per man when we had marched the first fortnight, and had eaten room for it in our bags. They seemed a small party to win a new province, mused Lawrence in Seven Pillars of Wisdom. The march to Akaba had begun. 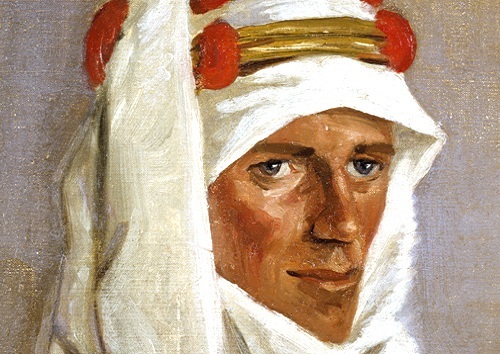 Events of 9 May 1917 as recounted by T. E. Lawrence in Seven Pillars of Wisdom (1926). in a Crossley tender and Model-T Ford car to salvage the wreck of Capt Stent’s aeroplane that had crashed on May 1. Unable to cope with the sandy terrain, the Model-T Ford car would have to be towed for much of the way, before being abandoned early on the second day. Shortly after, an aeroplane landed near the party, and Lawrence flew back with the pilot to Wejh. Later in the day, his pocket diary recorded a meeting in Wejh with Sir Mark Sykes, who had been in the Hejaz to speak to Sherif Hussein and Feisal. It would take the recovery party another three days to find the wrecked aeroplane and tow it back to Wejh, returning on 10 May. In an account of this trip written many years later, Henderson gave an interesting insight into working alongside Lawrence in the desert.